Atrial fibrillation is one of the commonest cardiac arrhythmias. Cardiac pulse, as well as cardiac frequency, depends and gets regulated by a part of he heart which is called sinus node and is situated in the right atrial wall. From there begin the electric impulses that travel to the ventricles and give the signal for cardiac contraction. 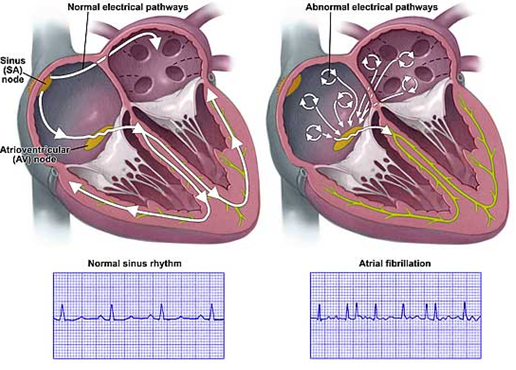 In case of atrial fibrillation, the cardiac atria are disorganized and the electric signals heading to the ventricles have a totally irregular rhythm, causing arrhythmia. Moreover, electrical signals are usually more than normal (>90 per minute), also causing tachycardia. Paroxysmal atrial fibrillation: Episodes are self-terminated (usually within 24 hours) and last <7 days. It usually occurs in the early stages of the disease. Persistent atrial fibrillation: Episodes that last >7 days or are terminated by medical intervention. Permanent or chronic atrial fibrillation: The arrhythmia is not terminated by medical intervention or it lasts long (>1 year). The main risk factor for the occurrence of atrial fibrillation is age (more than 60-65 years). Atrial fibrillation has been associated with several cardiac conditions (arterial hypertension, coronary artery disease, valve disease, congenital heart disease), recent heart surgery, chronic pulmonary disease, pulmonary embolism, and hyperthyroidism. Also, less frequently, atrial fibrillation is associated with serious infections (i.e. pneumonia), coffee or alcohol overconsumption, illicit drug use, some medications or with metabolic or electrolyte disorders. Finally, there are cases in which no specific cause or association is found. Atrial fibrillation can cause palpitations (flopping in the chest), weakness, lightheadedness (due to hypotension), confusion, shortness of breath or chest pain. In many cases, there are no symptoms and atrial fibrillation is diagnosed incidentally whereas sometimes, initial symptoms are those of stroke, which is one of the main complications from the disease. Diagnosis of atrial fibrillation is done with physical examination and is documented by an electrocardiogram. Due to disease association with other conditions, almost invariably additional tests are needed (echocardiogram, serum blood tests, chest x-ray, stress test, etc.). In case of acute onset of the arrhythmia that is accompanied by serious symptoms, it has to be clarified if this is atrial fibrillation or another more serious arrhythmia (i.e. ventricular tachycardia). Finally, it should be noted that diagnosis of atrial fibrillation in patients who have no symptoms is frequently delayed and, as a consequence, those patients do not receive prophylactic therapy for stroke prevention (see below). Therapeutic approach of patients with atrial fibrillation has 4 main axons: cardiac rhythm control, heart rate control, recurrence prevention, and stroke prevention. It is attempted in patients with paroxysmal or persistent atrial fibrillation. It is done with the use of drugs (propafenone per os, amiodarone iv) or with electrical cardioversion (with light general anesthesia), always under medical supervision. If the episode of atrial fibrillation lasts >48 hours then, before cardioversion, the patient needs to undergo transesophageal echocardiography in order to exclude the presence of thrombus that could be dislodged and cause stroke. In case when a thrombus is found, the patient should receive anticoagulants for 3 weeks and then cardioversion can be performed. It is attempted in patients with permanent atrial fibrillation or in those with persistent atrial fibrillation that is considered at high risk for relapse. Drugs that are commonly used are b-blockers, calcium channel blockers, and digoxin. Prevention of recurrence is done medically, with percutaneous intervention or surgically. Medically: usually with b-blockers, amiodarone and sotalol. With percutaneous intervention: with the use of a special catheter, which is inserted through the femoral vein, we do ablation in the area of pulmonary veins in the left atrium. Surgically: with the Maze technique that we use when the patient undergoes heart surgery for other reasons. In atrial fibrillation, the highest risk does not come from the arrhythmia per se. In patients with atrial fibrillation, the left atrium is disorganized, stops contracting, and the blood stagnates, facilitating thrombus formation. 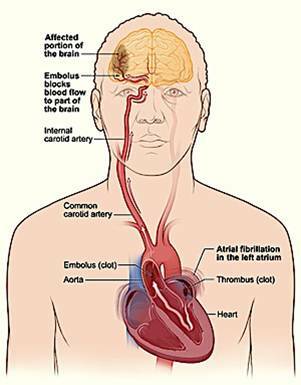 Through blood circulation, thrombi can reach the vessels of the brain, causing stroke. For this reason, patients suffering from atrial fibrillation should take anticoagulants, which partially inhibit coagulation, and prevent thrombus formation. The risk of stroke in patients with atrial fibrillation increases with coexisting risk factors. A special risk assessment score has been developed (CHA2DS2Vasc-Score). It can predict the annual incidence of stroke depending on how many risk factors a person has. According to the latest guidelines in Europe and America, patients with CHA2DS2Vasc-Score = 0 do not need prophylactic therapy, those with CHA2DS2Vasc-Score = 1 should take aspirin or anticoagulants whereas those with CHA2DS2Vasc-Score ≥ 2 should definitely take anticoagulants. The classic anticoagulant drug is warfarin (or acenocoumarol, Sintrom). Recently, new anticoagulants have been released: dabigatran (Pradaxa), rivaroxaban (Xarelto), and apixaban (Elquis). Novel anticoagulants have some advantages compared to Sintrom. They are somewhat more effective, there is no need for serial blood tests, their effectiveness is not influenced by nutrition, and they have fewer interactions with other drugs. Their main disadvantage is increased cost, whereas experience in their use is relatively limited. Finally, it is considered that elderly patients with instability problems and falls on the ground should avoid anticoagulants because of the risk of cerebral bleeding if they get hit in the head. For patients who cannot take anticoagulants because of previous serious bleeding or due to contraindications, interventional cardiology has to offer a new treatment. Through a catheter, we place a special device in the left atrium of the heart in the area where blood clots are formed (the appendage of the left atrium), excluding it from the circulation and, thus, minimizing the risk of stroke. The technique is called percutaneous left atrial appendage closure. Read more HERE.